1 of 5 In a medium bowl, combine coffee, onion, molasses, ketchup, vinegar, soy sauce and hot sauce. 2 of 5 Place ribs in a large baking dish and pour marinade over the top. Evenly coat ribs with marinade. Cover with plastic wrap and refrigerate overnight. 3 of 5 Set a gas or charcoal grill for indirect heat. 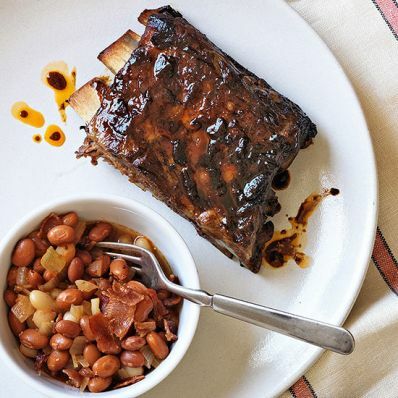 Wrap ribs tightly in a single layer in heavy-duty aluminum foil. Grill ribs in foil over indirect heat for 2 hours, turning after 1 hour. 4 of 5 Remove ribs to a cutting board and cut into 3 portions. Set grill to high. Brush ribs with marinade and grill about 3 minutes per side. Place marinade in a saucepan, bring to a rolling boil and cook 3 minutes. Cool. 5 of 5 Serve ribs with cooled marinade as a dipping sauce. Per Serving: 29 g Fat, total, 460 kcal cal., 0 g fiber, 14 g carb., 10 g sat. fat, 123 mg chol., 670 mg sodium, 35 g pro.